Chops is a game by Craig Nybo, published by Quirky Engine Entertainment. It is for 2-5 players. In this game, players will take on the role of rockers trying to form their own band. They will play gigs to earn money and the ever important BUZZ. They’ll have to be careful as Fate and their rivals can halt their rise to the top. In the end the band with the most BUZZ will be declared the winner. To begin, the board is placed in the middle of the play area. 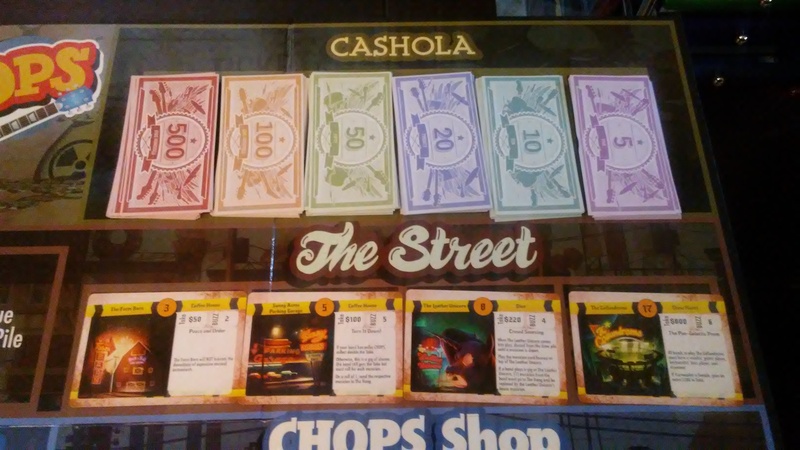 The different denominations of Cashola are placed in stacks on their respective places on the board. The Venue cards are separated from the rest of the deck. They are then shuffled and placed face down on the Venue space on the board. The remaining cards form the Market deck which is then shuffled. Each player is then dealt 5 cards from the Market deck. The remaining cards are placed face down on the Market space on the board. If a player has any Fate cards in their hand, these are randomly placed back into the Market deck and a new card is dealt to the player. Once all players have a hand of cards with no Fate cards in it, the Market deck is shuffled one more time. The BUZZ guitar picks are placed in a pile on the BUZZ pit area of the board. The top 4 cards of the Venue deck are dealt out onto the 4 Street spaces marked Venue. Each player is given $500 in Cashola. The first player is chosen and play now begins. The game is played over several rounds. Each round a player will take their turn consisting of 3 actions. There are several actions that a player may take. I’ll briefly discuss each one. First, a player may play a gig. Only 1 gig is allowed to be played on a player’s turn, unless they have an Amp Up card that states otherwise. To play a gig, the player simply selects one of the Venue cards from the Street and adds up their band’s CHOPS rank, applying any modifiers from other cards in play. Other players are allowed to play Rivalry or Amp Up cards either before or during a band’s gig. As long as the band’s total CHOPS rank is equal to or greater than the Venue’s required CHOPS rank, the gig is played and the player collects the corresponding amount of Cashola from the bank. They also collect BUZZ guitar pieces as noted on the Venue card. The player then keeps the Venue card and draws a new one from the deck to replace it with. It should be noted that each Venue has House Rules which should be read before taking a gig. Another action that may be taken is to hire a musician. This is done by choosing a musician card from either the Hang or the player’s hand and paying their Hire rate to the bank. The Musician card is then placed in front of the player alongside the other members of the player’s band. A player is only allowed to have 5 members in their band. It should be noted that each musician has their own baggage, which are special rules that apply to that musician and can affect the rest of the player’s band. Another action is to play an Amp Up card or a Rivalry card. This is done by simply playing an Amp Up or Rivalry card from the player’s hand that is noted to be played as an action on the card itself. The player then reads the text aloud and follows the rules. It should be noted that Rivalry cards are played on a band but may be played on the player’s own band if they so choose. Yet another action a player may take is to break one of their musician’s instruments to get rid of a Rivalry or Fate card. If a musician’s specialized instrument is smashed, the card is removed from the band member and placed in the discard pile. The band member then switches to their standard instrument. If the musician’s standard musical instrument is smashed, the band member is turned sideways and may not play any gigs with the band as they are now instrumentless. It should be noted that if a band member is forced to sit out a gig for any reason, they become demoralized. The player must roll the die to see if they stay in the band. 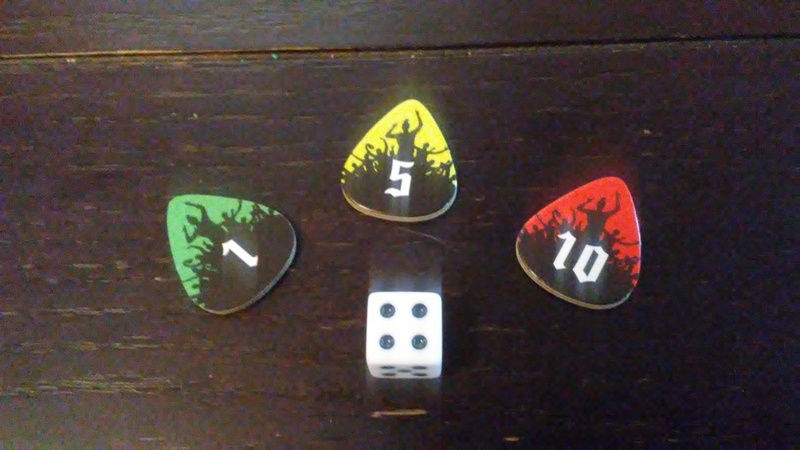 If the player rolls a 1, the musician leaves the band. Other players can recruit the demoralized musician. Interested players are allowed to roll the die. The highest roll is then able to recruit the musician. Also as one of a player’s 3 actions, the player may replace a broken musician’s instrument by paying $200 to the bank. The player then turns the musician card right side up. They are now able to play gigs with the band. Also as an action, a player may buy a specialized musical instrument that corresponds with one of their band members. 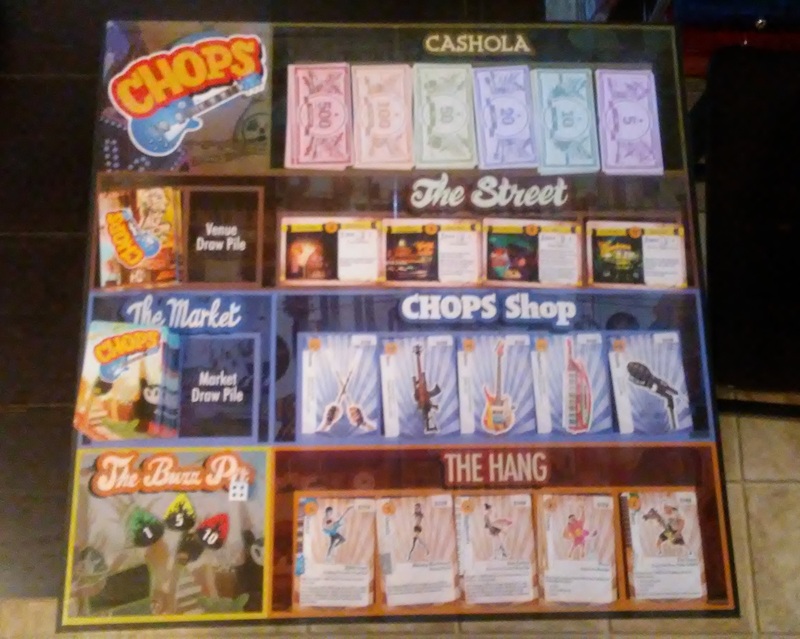 To do this the player chooses a card from their hand or from the CHOPS shop and pays the market value on the card to the bank. The player then places the specialized instrument card beneath the corresponding musician card. If the musician was turned sideways because they had smashed their standard instrument, the card is turned right side up and now gains both the specialized musical instrument as well as their standard instrument. Another action that a player can take is to place a musician from their hand into the Hang. This allows them to then draw a new card from the Market deck. Also as an action, a player can discard an Amp Up or Rivalry card from their hand and draw a new card from the Market deck. Also as an action, a player may fire a musician from their band and place them into the Hang, freeing up space to recruit new musicians. The last action a player can take is to pawn a specialized instrument. 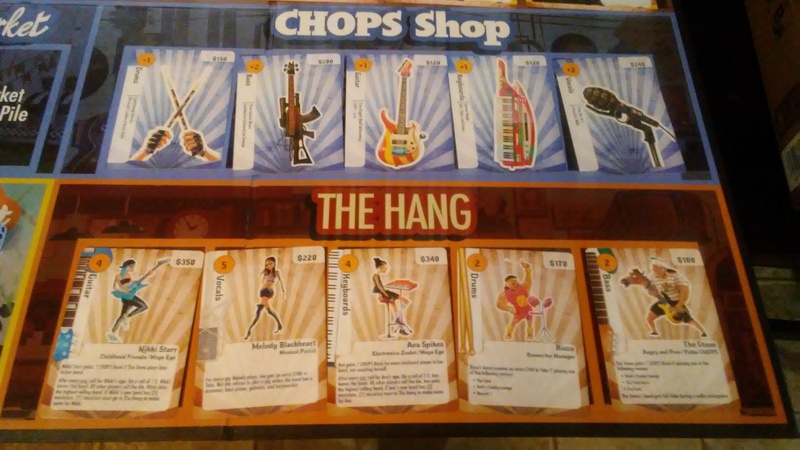 To do this, the player simply takes a specialized musical instrument card either from their hand or from a musician in their band, and places it into the CHOPS shop. The player then collects the market value of the card in Cashola. If a player chooses not to take any actions, they may take a day job. This allows the player to skip their turn and collect $100 plus $50 for every musician in their band from the bank. Once a player has performed their 3 actions, they mus end their turn by putting up the universal sign of Rock and Roll and saying “Rock on!” Play then passes to the next player. It should be noted that players also have several free actions that they may take during their turn, which does not count against their 3 turn actions. These free actions may even be taken during another player’s turn. A player may play a free play Amp Up or Rivalry card. They may smash a musician’s instrument during a gig by turning the musician card sideways. They may pawn a musician’s standard instrument by turning the musician card sideways and then collecting $150. They may Sell Out by trading in BUZZ and collecting $100 for every BUZZ discarded to the bank. Also of note are Fate cards. When these cards are drawn from the Market deck, they are immediately played. These cards will then affect all players. If a Fate card is drawn and played, it does not count as a player’s turn action. The game continues until the last Venue card is placed face up on the Street. At this point, the game ends immediately. Players gain BUZZ rewards for several different things, such as having 5 members in their band, or playing the most gigs. For more information on BUZZ rewards, check the rule book. Players then add up all their BUZZ from their BUZZ guitar picks. The player with the most BUZZ wins and is declared the Top Rocker. This game has a lot of really rockin’ parts. First off there’s the BUZZ tokens that are brightly colored guitar picks. These are very thematic and look absolutely amazing. I’d have never thought of using picks as tokens but what a cool idea. I like the artwork on these as well. Next there are the cards. There are quite a lot of cards included with this one. They are really great too. The artwork on each one is really amazing. The look and feel of each is very thematic, especially when it comes to the various Venues, musicians and instruments. The finish and thickness on the cards is really nice as well. Of course the game also comes with a die. Pretty much your normal every day die. Nothing special. Next I need to mention the insert. It’s ok. It’s got plenty of room for all the tokens and cards but it feels like there’s too much room inside the box, especially when it comes to the cards. There are dividers molded into the insert but it feels like they’re a bit too far apart to adequately separate the different card types and keep them from flying around in the box. Then there’s the board. This is also ok. I like the fonts chosen for the board, but it feels like the board is a bit too subdued. With this game being about Rock and Roll, I’d have liked a little more color and life to the board. I think this could have been a little more thematic and appropriate, however I’m not gonna complain too much. After all, most of the board is covered with cards anyway. Finally I come to my biggest gripe, paper money. I really don’t like paper money. It’s just too flimsy and easy to tear up. While the artwork and colors are nice, I really wish that something different had been chosen instead. I get what the designer was thinking and thematically it makes more sense to use money that looks more like money, still though I’m not a fan of it. My few minor gripes aside, the game as a whole looks really nice and thematic. As long as you’re ok with those issues, you’ll like it overall. The rulebook looks good. There are lots of great looking pictures throughout the book. Unfortunately there are no examples of gameplay. Every card type is explained in great detail including how to use them and what they do. There’s a simple breakdown of a player’s turn that includes turn actions and free actions, as well as the other aspects of a turn. The one thing that I found a bit off is that you really have to go looking into the different card types to get to the real nitty gritty of how to perform each action properly. While the breakdown is nice, it doesn’t really explain each action in enough detail. I found myself hopping back and forth from page to page to find what I was looking for each time, at least for the first game or two. Not a really big deal, but I would have preferred a bit more streamlined rules. I will say that the reference on the back cover is quite nice though. Once you’ve got the rules down, it really helps show you the different actions, both turn and free, that you can take on your turn. It also shows the different BUZZ rewards that a player can earn. Overall, it’s not bad and everything is covered pretty well. I didn’t find anything hard to read or understand. Like I said, once you play through a game or two it won’t really be a problem anyway. This game has several flaws as far as components and rules, however the gameplay isn’t one of them. It’s actually a pretty solid game that really gives you the feeling of being in a Rock band, or at least managing one. In a lot of ways, this game is what I wanted Rockband Manager to feel like. Each musician is incredibly unique and has a life all their own. Some of them will really make you think twice before throwing down your money to add them to the band. I really like that you can make a band of any type. You want a band full of singers, have at it. You want 3 drummers and 2 bases, go for it. You can pretty much do what you want, which is actually quite cool. As you start venturing out into the music scene, you’ll start playing gigs to make some hard earned money. Some venues are simple and fun, while some you really have to play the odds because it might mean the death of some of your band members. I like that each venue has it’s own feel that really adds to the theme of the game. The random Fate cards are a nice way to really shake things up as well. You never know when one will come up so it’s not like you can really prepare for it. Kind of like real life. I will say that I’m a bit on the fence about the Amp Up and especially the Rivalry cards. These tend to remind me of playing Munchkin. Munchkin is one of those games that either you love or hate. For me, it’s depends on who I’m playing it with. With the right players, Muchkin is fun. The same can be said for this one. If you have players that enjoy the chaos brought about by the Amp Up and Rivalry cards, then you’ll like this one as well. In a way, I’m sure that there will be some comparisons to Munchkin and I get it. That said, this one is a lot more thematic and doesn’t rely as heavily on chaos as Munchkin does. I actually like this one quite a lot. Since I brought it up, I’d say that fans of Munchkin might enjoy this one. Players that wanted more out of their game of Rockband Manager will be very happy with this one. I find it to fit the theme really well. It’s full of Rock and Roll goodness. 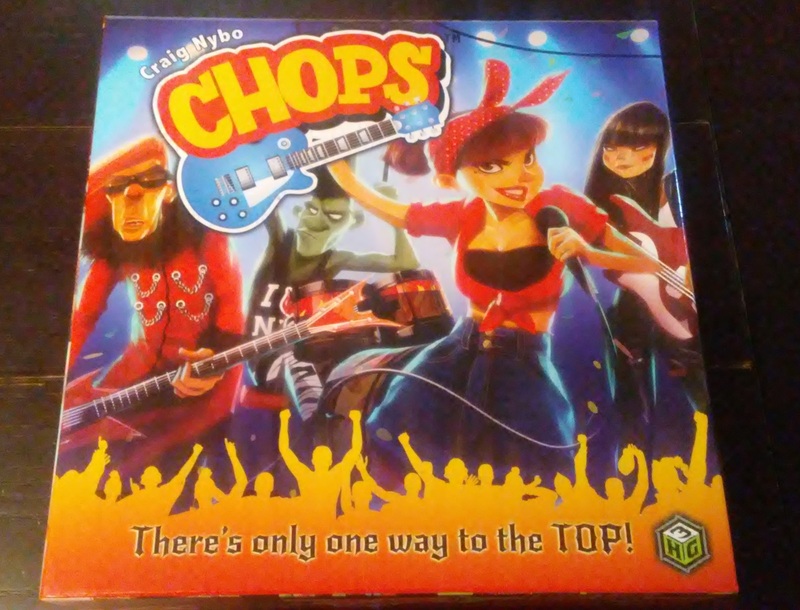 Chops is a medium to light weight game of Rock and Roll goodness. It’s fairly quick and doesn’t take too long at all. Most game sessions last around 30 minutes or so. Of course with more players it takes a bit longer. For the most part, the components are great. The artwork is really fun and thematic and the game is pretty much spot on. That said, I’m not a fan of the insert, which seems to be a bit too wide to contain the cards. I also don’t like the paper money, which is actually more thematic. It’s just a personal choice. I also wish the board had been a bit livelier and more colorful but it’s really just personal choices there too. The rulebook gets the job done, but it’s not as stream lined as I’d have liked for it to be. The game itself is actually quite fun, even with the minor issues that I’ve stated. The game gives you an actual feel for what it’s like to be a band manager without having to set foot in some greasy stink hole of a venue. In a lot of ways this is the game that I wanted Rockband Manager to be. Fans of that game or that wanted more from it, should most definitely enjoy this one. The game also has a good bit of chaos through the use of many of the cards. In this way, it reminds me of Munchkin. For that reason alone, fans of Munchkin may enjoy this one too. Overall, the game has a really great theme that is conveyed quite nicely. The game is pretty much family friendly and is short enough that even the younger players won’t get bored with. I would recommend giving this one a try, especially if you’re looking for a good band manager themed game. I like it. Now, Rock On! For more information about this and other great games, please check out Quirky Engine Entertainment at their site. This entry was posted in Reviews and tagged board, board games, card, card games, chops, craig, craig nybo, engine, entertainment, games, nybo, quirky, quirky engine entertainment, rock, rock and roll, roll. Bookmark the permalink.